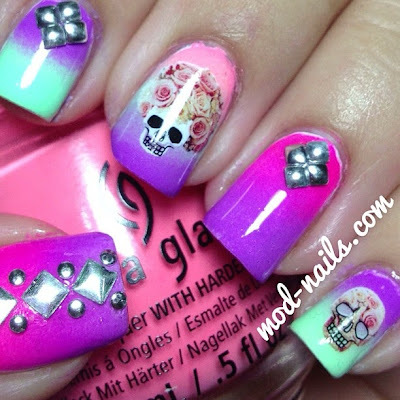 Here's a fun neon gradient look with some skulls and studs. Make sure to use my 10% off code at checkout (GYL91) on BornPrettyStore and they offer free worldwide shipping. The sunsational collection from China Glaze this summer is probably one of my favorites. I used the sponge technique for the gradient and for the water decals I used tweezers to hold them under water then slid the decal off and added it to my nail, and added top coat over it! I love skulls so these were perfectttt.